This is a game that could decide everything in the group because if the away team loses, they will be eliminated from the tournament and all of the other teams will have their passage through to the next round assured. Given that Budocnost have a 0-5 record, it is likely that they will be eliminated soon but if Malaga take control of the game, this could be the deciding game. The Spaniards come into this game knowing that they have already defeated Budocnost this season, winning by 62-86. This is one of the two games that the Spanish side have won this campaign so while Unicaja Malaga haven’t been great, they have shown a level above Buducnost and this should stand them in good stead for this clash. The side from Malaga has achieved an average of 79 points per game this season and they are getting an average of 14.8 points per game from Kyle Fogg while Jamar Smith is chipping in with an average of 11 points per game. It has been a torrid season for the away team so far this campaign, losing every game they have played in Group C in the Eurocup. They have only managed to score an average of 67.4 points per game this season and know that a loss here confirms their exit from the tournament. Marcus Williams and Boris Savovic, both with an average of 13.2 points per game have had an impact but it has never been enough to take control of a match for the away team in this game. Shipping an average of 82 points per game is a massive reason why Budocnost are in the position they are in. It does look as though this game is hugely set up for a home win, and the only issue is the margin of victory. Knowing what is at stake, look to take Unicaja Malaga at -13.5 which is provided at odds of 1.90. 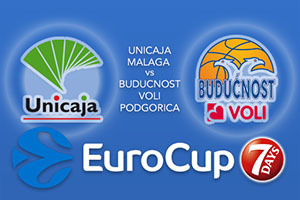 For the Over/Under market in this crucial Eurocup clash, look to go OVER 145.0 which is provided at odds of 1.90. Bet Now!